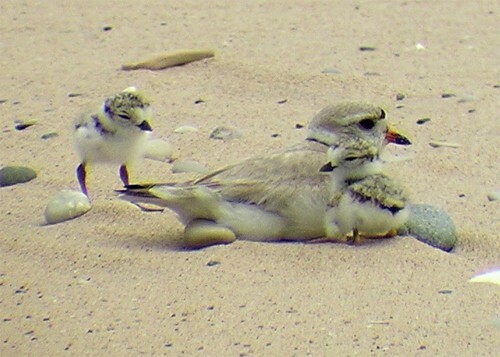 The Sleeping Bear Dunes National Lakeshore reports that after several years of limited piping plover nesting activity in the Glen Haven area, four pairs of the federally endangered shorebird have made that beach their home for the summer. This easily accessible location provides visitors an excellent opportunity to view a rare bird in its natural habitat, as well as have questions answered by National Park Service employees and volunteers who will be on site throughout the nesting season. The entire shoreline will be open for walking; however, certain areas of the beach will be temporarily closed to all entry. Visitors are asked to respect these closed areas, quietly observe birds from a distance, and not disturb birds sitting on nests. National Lakeshore Superintendent Dusty Shultz noted “for the survival of the piping plover, it is critical that dogs be kept on a leash under the control of their owner. Otherwise, the dog’s natural chase instinct could result in harm to these rare birds.” Adults that are frightened off a nest will stop incubating eggs and often completely abandon the nest. Unleashed dogs may catch and kill piping plover chicks. In the Glen Haven area, pets are prohibited on the beach from the Maritime Museum (including the grounds of the Maritime Museum) all the way around Sleeping Bear Point to the stream outlet of North Bar Lake. Pets on leashes are allowed on the beach east of the Maritime Museum to D. H. Day Campground. Much more about piping plover can be found at the piping plover page from the Sleeping Bear Dunes National Lakeshore and also at Piping Plover (charadrius melodus) on Michigan in Pictures. Here’s a video of piping plover from the other side of the state on Saginaw Bay.